Purified Water, Raw Cane Sugar, Malt Extract (from Barley), Glucose Liquid (Sulphites), Honey, Lysine (HCl), Iron (Ammonium Citrate Complex), Vitamin C (Ascorbic Acid), Natural flavouring (Orange Ext. ), Zinc Sulphate, Natural Source Colours: Beetroot Red (Beetroot Concentrate, Mono propylene glycol, Ascorbic Acid), Mixed Carotene (Polysorbate 80, Sunflower Oil, Carotene, Mono & diglycerides of Fatty Acids, Ascorbyl Palmitate, DL alpha Tocopherol), Acidity Regulator: Citric Acid, Thiamin (Vitamin B1 HCl), Thickening agent (Xanthan Gum), Calcium Glycerophosphate, Niacin (Nicotinamide), Pantothenic acid (D-Panthenol), Vitamin B6 (Pyridoxine HCl), Preservative: Potassium Sorbate, Vitamin B2 (Riboflavin Sodium Phosphate), Copper Sulphate, Manganese Sulphate, Folic Acid (as Pteroylmonoglutamic Acid), Potassium Iodide, Vitamin B12 (Cyanocobalamin). Allergy Advice: For allergens, including cereals containing gluten, see ingredients in bold. 1/2 a teaspoonful twice daily. Shake well before use. Do not exceed the recommended intake. Feroglobin Liquid can be continued for as long as required. To open bottle, press and turn childproof cap. Once opened use within 3 months. This formula replaces other Feroglobin products. Why has Feroglobin Liquid been developed? When is Feroglobin Liquid recommended? What do I need to know before starting to use Feroglobin Liquid? Can Feroglobin Liquid be used simultaneously with medications? Is Feroglobin Liquid suitable for vegetarians? How and when should Feroglobin Liquid be used? 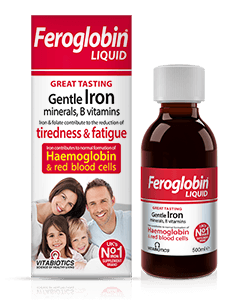 Are there any undesired effects whilst taking Feroglobin Liquid? 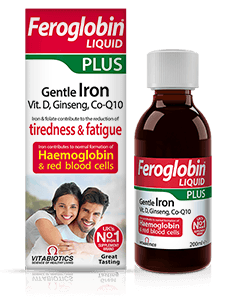 Feroglobin Liquid provides a gentle, excellent tasting source of iron which contributes to the normal formation of red blood cells and haemoglobin. 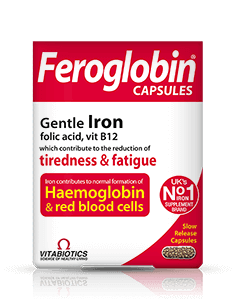 Feroglobin Liquid provides an ideal source combining iron with other nutrients such as zinc, copper, and B-complex vitamins. Feroglobin Liquid is suitable for people of all ages, as a nutritional safeguard to help maintain health and vitality. Feroglobin Liquid is particularly suitable for: growing children, during pregnancy, menstruating women, athletes and slimmers. Feroglobin Liquid is formulated for long-term use and can be taken for as long as required. There is no maximum length of time over which it may be used. Feroglobin Liquid is suitable for people of all ages including children and young infants. 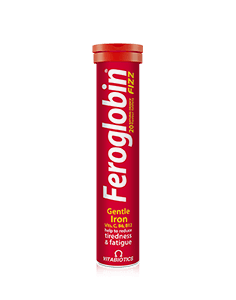 Feroglobin Liquid provides an ideal source of iron in combination with 14 other nutrients, carefully blended with natural fruit extracts, honey and malt to give the liquid a pleasant taste, and is ideal for those who have difficulty swallowing capsules. Generally, Feroglobin Liquid can be taken alongside medications because it contains only moderate levels of vitamins and minerals. For specific advice on taking Feroglobin Liquid with medicines, we recommend that you contact your doctor or pharmacist first. Yes, Feroglobin Liquid is suitable for vegetarians. Please note Feroglobin Liquid is not suitable for vegans as it contains Argentine Premium Blend Natural Bees' Honey. 1 teaspoonful = approx. 5 ml. Children (3-6 years): ½ a teaspoon twice daily. Children (7-12 years): 1 teaspoon 1-2 times daily. Adults (Men & Women) 1 teaspoon 2 times daily. During menstruation or pregnancy, one teaspoonful three times daily is recommended. Do not exceed the recommended intake. Feroglobin Liquid can be continued for a long as required. Feroglobin Liquid has no known side effects when taken as directed. This product contains iron, which if taken in excess, may be harmful to very young children. Keep out of sight and reach of children. Do not exceed the recommended intake. In case of overdose, seek medical advice immediately.